A Victorian ghost story with a hint of Bronte and a splash of myth: such is The Strangely Beautiful Tale of Miss Percy Parker by Leanna Renee Hieber. In an almost-hidden realm in Victorian London, the supernatural occasionally bubbles into the normal realm to cause events which most cannot understand…but then, Alexi Rychman and his friends are not most. And Percy Parker is about to stumble into their world. There is richness and passion in the people on these pages, and it shines forth even through the constraining veil of Victorian manners. Or perhaps it shines so brightly because of this contrast? There is Percy Parker, as pale as the ghosts no one but she seems to see, haunted not by specters but by the cold eyes of all who scorn her for being different; the brooding and handsome Professor Alexi Rychman, for whom Percy cannot shake her fascination; and Rebecca Thompson, the no-nonsense headmistress with a connection to Alexi which Percy doesn’t understand. Not to mention kind and friendly Michael, ever-sarcastic Elijah, and the rest. These characters’ relationships are both bitter and sweet, full of the complexities of all human relationships. And the mood these conflicts create sets the stage very nicely for the gothic gloom and mythological beauty. The mix of myth, history, and the supernatural in this novel is refreshing. In a novel set in England, one might expect to deal with myths of fairies and Celtic spirits, but not a legendary love story of another ancient land. And to tie it into stories of famous English ghosts and Jack the Ripper is just something no one else has ever thought of. The magic and mystery tumble open in a series of breathtaking circumstances which fly by with each eager turn of the page. The book is short enough to read comfortably in a day, and that’s a good thing because I, for one, couldn’t put it down. It clips along at a steady pace, balancing mystery, romance, and action scenes so that things never get static. The plotting wasn’t perfect, mind. There was a bit of predictability here and there, and I can’t grasp why no one saw through the villain right from the start; the villain was so transparent to me. Also, one particular assumption the Guard makes over a definition bothered me because their definition was so narrow—which was rather convenient in allowing them to overlook something important. And in the powers of the Guard, Rebecca is supposed to be Intuition. But regarding the one thing which leads directly to the climax, I didn’t find her very intuitive. Also, Michael’s power seems vague, weak. I’d like to have seen a better display of the Heart, what it means, and why it’s so essential. Despite this, though, The Strangely Beautiful Tale of Miss Percy Parker was more than a worthy read. For those who love dark old London, mannerly mysteries, magic, and gothic romance, this is a book for you. It’s like a student in a mythology class crashed into a British Literature student and their notes got all shuffled together. 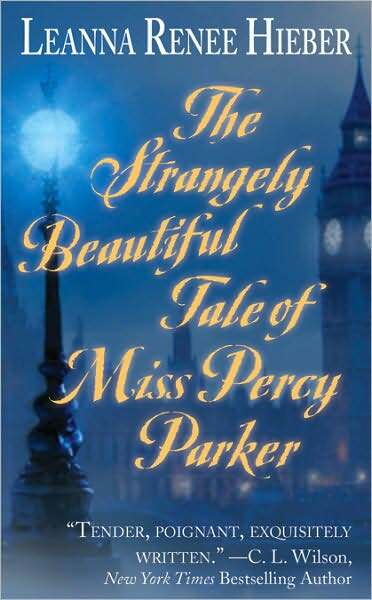 The Strangely Beautiful Tale of Miss Percy Parker is a haunting and, yes, beautiful story. It is the first in a series of Strangely Beautiful tales, and Leanna Renee Hieber has set the bar high for herself. There is much potential for these next books. As an added benefit, I got to meet Leanna Renee Hieber recently. She’s a Cincinnati area native like myself who came home to do an Ohio book tour. At her reading and signing, she talked briefly about the coming books in the series. She plans for a series of five books, not all of them featuring the characters from The Strangely Beautiful Tale of Miss Percy Parker. The series will include a prequel, taking readers back to the Guard’s origins, and will run into the twentieth century at the time of WWII. (Or did she say WWI? I can’t remember!) She is super, super nice, not to mention fascinating. Leanna Renee Hieber is an actress, which certainly made her reading interesting. Not every writer can read each of her characters in a different voice! Suffice it to say that this is one instance where the author is as charming as the world she has created. I can’t wait to read the next book. You’re welcome! I’m so glad you liked the review! I’m tempted by this one too, and Wench made me want it even more! It does sound intriguing! I remember thinking so when I saw the debut showcase, and the review reinforces it.